After hearing this, I did some research (it was before the internet existed), and learned that Sojourner Truth (1797-1883) was important in the history of America. An Abolitionist and women’s right’s activist, she spoke the truth about slavery at a time most of America lied about it. Like every child, I wanted to be affected by things—I loved music and poetry—yet I also wanted, unknown to myself, to be superior to everything I saw. Eli Siegel taught: “There is a disposition in every person to think we will be for ourselves by making less of the outside world.” This is contempt, and it is what makes us not want to see we are related to others. The feeling that we increase ourselves by lessening another is also, Eli Siegel said, the cause of all injustice, including racism today, as it was the cause of slavery. Quite early, I didn’t like the fact that I was related to other people; I wanted to be different—and above. I felt so different from everyone in my family that I got insulted when people commented on a physical resemblance. I joined a sorority in high school, but soon dropped out, telling myself it was ridiculous to think I had anything in common with all those girls. I felt I was deeper, more mature. But increasingly, to maintain this superior picture of myself, I had to make things up, and change the truth, to give the impression I had a mysterious past, romantic liaisons, and a great deal of knowledge I didn’t really have. I love Eli Siegel for teaching me the true purpose of life: to like the world on an honest or accurate basis. Because I had built myself up falsely, I was afraid the truth would lessen me. But as I studied Aesthetic Realism I began to learn what is true about the world and myself: Every person comes from the world and has its aesthetic structure: a oneness of opposites. Through knowing other people, we learn about ourselves. 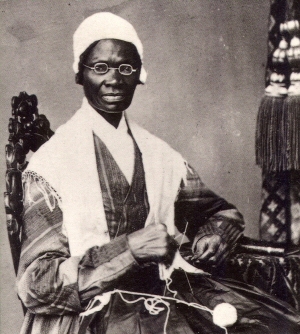 And one of the persons I loved coming to know was Sojourner Truth, born Isabella Baumfree, in Ulster County, New York in 1797. She woke America up to the lie of slavery. The possibility of thinking that something is true which isn’t, or something isn’t true which is, is unlimited for everybody. If, no matter what our senses tell us, we hear nothing but one thing, we can come to feel that that is so…The possibility, even, of believing something which is against us, is unlimited. …One of the things that should occur in America is for people to take a week off and spend the time asking, “How have I come to see the things I think are true to be true?” I think this would save the world. A lie people throughout history have wanted to believe is that some people are inferior to others. People, not thinking much of themselves, Mr. Siegel explained, try to build themselves up by seeing others as inferior, rather than trying to see what is true. Contempt, Eli Siegel saw, is the cause of slavery; it is the cause of all forms of prejudice. Sojourner answered with tremendous conciseness and not a little salt: “Perhaps not, but the Lord willing, I’ll keep you scratching.” And that is what she did. She made people uncomfortable unless they were tackling the problem of slavery. 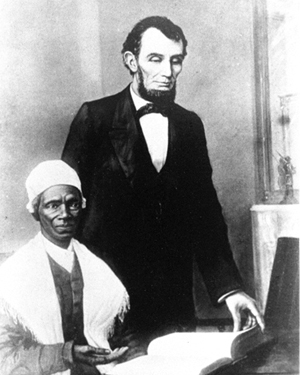 In 1864, Sojourner Truth met with President Lincoln, and later was appointed to work with newly freed African-Americans in Washington. She never stopped fighting for what she saw as true. 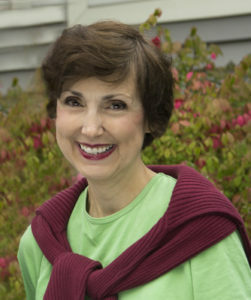 There is a description of her at nearly 80, standing on a Washington D.C. corner with streetcars refusing to stop for her, and shouting, “I want to ride!” until a crowd gathered and forced a streetcar to stop. Aesthetic Realism says we cannot love ourselves unless we love truth, because the basis on which we care for ourselves is how much we care for truth. I can say this as a mathematical statement: it is invariable. The other kinds of like are phony; they won’t work; they don’t convince the deepest unconscious. It will be found that black and white man have the same goodnesses, the same temptations, and can be criticized in the same way. The skin may be different, but the aorta is quite the same.